High-pressure processing has a long game going on. As in, along the floor. Horizontal orientation is now the norm for machinery that performs high-pressure processing (HPP). The earliest versions of HPP equipment were vertical, but as the technology has increasingly taken hold, horizontal equipment that can handle higher volumes has come to dominate the market. It’s a sign of how HPP is maturing as a technology, its advocates say. According to an estimate by Hiperbaric (www.hiperbaric.com), a provider of HPP equipment, global HPP food production reached 3.4 billion lbs. in 2017. 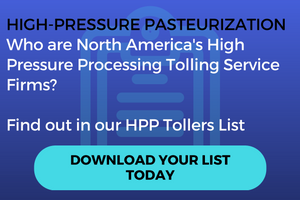 More than 200 industrial-scale high-pressure pasteurization (HPP) machines are in service in North America, most owned by food companies that primarily use them for their own products. A growing number are owned by tollers who accept packaged food and beverage products in fee-for-service arrangements. Here is a list of those firms. “There is a great acceptance in several high-pressure processing products worldwide,” says Roberto Peregrina, director of Hiperbaric USA. “HPP shouldn’t be considered a novel technology anymore.” It’s moved into mainstream applications. Subway, Panera and other chains now get some of their lunchmeat from HPP processors; HPP user West Liberty Foods has won Subway’s supplier of the year award several times. Horizontal equipment, like this machine from Hiperbaric, can achieve higher throughput than the early, vertical models. Both Hiperbaric and its biggest rival, JBT/Avure (www.avure-hpp-foods.com), now market mostly horizontal machines. The only vertical machine now available from JBT/Avure is the SS, designed especially to process seafood. (Its vertical orientation allows it to separate out sand and other impurities). Avure also markets horizontal models modified to handle seafood. The point of the switch to horizontal is to allow higher volumes. The highest-volume JBT/Avure machine is the AV-70X, so called because it can, under the right conditions, process up to 70 million pounds of product per year. JBT-Avure’s X-line of high-pressure processing equipment can be upgraded for higher throughput without increasing its footprint or overall size. If market predictions can be believed, that extra volume will be needed. According to Markets & Markets, sales of HPP products will reach half a billion dollars by 2022 – a jump of 90 percent over 2016 (the last year for which estimates are available). The Markets & Markets study predicts that by 2022, the foods processed through HPP will fall into roughly the same categories they do now: fruits and vegetables, followed by meat, seafood, juices and other beverages, and a jumble of others including dairy products, grains and condiments. Errol Raghubeer, senior VP of microbiology and food technology for JBT/Avure, says the breakdown of products processed on his company’s equipment is about 35 percent meat and other proteins, 20 percent beverages, 20 percent dips such as guacamole and the rest wet salads and other products such as ready-to-eat meals. This product variety points up a crucial aspect of HPP: It can handle a surprisingly wide range of products, as long as they have enough water activity and meet certain other requirements. The equalization of water pressure on all sides of the packaging means that the product within is not ruptured or distorted. In practical terms, this means the decision to use HPP often is dictated less by technical considerations than by comparison with other preservation options, like thermal treatment or preservatives. Cost is the most common consideration – but by no means the only one. Sandridge Food Corp. (www.sandridge.com) is a processor of entrees, wet salads, soups, sauces and other products for retail, foodservice and club stores, including a substantial business for supermarket delis. Not all of its products use HPP, but all of the ones developed in the last half-dozen years or so do, says John Becker, senior director of marketing. That’s still the primary motivation. When tainted egg salad from another company made some consumers sick about a year and a half ago, Sandridge decided to start using HPP for all its egg salad and not raise the price. Another other major benefit of HPP is that it allows processors to cut back on preservatives, or even eliminate them. That gives the benefit of a clean label, which in many cases is the primary consumer appeal of HPP. HPP goes a step beyond preservatives. A preservative can only prevent microorganisms from growing; HPP actually kills them. That’s why Natural HPP (www.naturalhpp.com), which claims to be Canada’s only “toll” (contract) HPP processor, does a significant business in reworking of contaminated product. Recently, for example, a processor had 10,000 kilos of cooked bacon contaminated with listeria. With the agreement of the Canadian Food Inspection Agency (equivalent to America’s FSIS), Natural HPP processed and repackaged the bacon, ridding it of listeria, Carrier says. Good Foods adds a “High Pressure Certified” seal to the labeling for its products like guacamole. HPP also competes with thermal processing, which is a pathogen kill step. HPP's advantage there lies in how it avoids the changes to flavor, color and other factors that heating brings about. Processing through HPP is so profoundly different from thermal processing that it often requires major changes to a formulation, says Joyce Longfield, vice president of product innovation for Good Foods (www.goodfoods.com), a processor of dips, dressings and wet salads. She gives the example of cream of mushroom soup. “The ingredients in that product would probably thicken more under pressure than it would with pasteurization, and you would get this congealed clump,” says Longfield, who also serves as chair of the Cold Pressure Council, an industry group for HPP suppliers and users. “You wouldn’t get a soup anymore.” The formulation would have to be adjusted and diluted, probably with less fat, starch and protein – reduction of the first two of which would probably be a net positive. Probably the biggest competitive disadvantage of HPP is price. The increase in volume that’s available with newer HPP equipment will help mitigate this, but as a batch process, it just can’t match the kinds of throughput available with preservatives or thermal processing. Becker acknowledges that getting potential customers to accept the price premium of HPP can be a problem. HPP users sometimes handle this situation by positioning these products as premium, which the clean, no-preservative label helps support, Longfield says. She mentioned Good Foods’ guacamole, sold in Costco, as an example of such a product. “Those products tend to already have a premium price, so when you throw in a technology like HPP, it’s in a way kind of hidden to the consumer, because they’re already expecting to pay more,” she says. One of the biggest challenges in using HPP is deciding how much capacity you need. Too little would mean trouble filling orders, but too much would be a waste of capital funds. JBT/Avure has addressed this problem by developing scalable versions of its equipment. The AV-X series can be scaled up to increase capacity by up to 100 percent – all without increasing the machine’s size. This is possible because increasing the machine’s capacity is a matter of adding more “intensifier pumps,” the component that brings the water up to the extremely high pressure needed for treatment – 87,000 pounds per square inch or more. “The time to bring the water under that high amount of pressure takes less time as you add intensifier pump,” says Lisa Wessels, JBT/Avure’s director of marketing. The time that the food actually spends under high pressure does not change, but the overall cycle time decreases, allowing higher throughput. The pumps are added to a “pump skid” that doesn’t change size; the only other major change is additional electrical connections, which fit in an already existing cabinet. As HPP becomes more mainstream, more processors will find it a rational alternative to thermal processing and preservatives for quality and safety. Affiliated but separate company formally adds co-manufacturing to APC's services.